Located on the third floor of the posh Pendry Hotel, The Pool House brings a breath of fresh air to the Gaslamp Quarter. Those who have experienced this contemporary escape will agree that The Pool House offers high-quality service paired with first-rate menu options. As summer comes to a close and we enter into fall, let's take a look back Rooftop Social at The Pool House. Each week night of the summer we were able to feast on tasty bites and sip on signature cocktails, all the while being serenaded by some of San Diego's top local DJs. Rooftop Social offers an array of deals during Happy Hour from 5pm-7pm, including $1 oysters and half off cocktails and appetizers. We had the opportunity to speak with The Pool House Marketing Coordinator, Ali Le, and get her thoughts on the debut season of Rooftop Social. What was the inspiration behind Rooftop Social? Very similarly to its name we wanted to curate a place that friends and coworkers could socialize after a work day (that is paired with yummy food and drink specials!). Personally, I am constantly looking for a happy hour spot that has a great ambiance as well. The rooftop reminds me of a mix between a Miami and LA ambiance. Rooftop Social offers amazing Happy Hour food and drink specials, what is your personal favorite item to order? Another thing I look for when looking for a prime happy hour spot.. oysters!! The $1 oysters during Rooftop Social are a must. When I'm feeling like a beacon of health, I go for the Kale Caesar salad. When I'm feeling like indulging in a damn good burger, the Pool House burger is the way to go. It's melty perfection. But my all time favorite thing on that menu is the lobster roll. Now that the first season of Rooftop Social is coming to an end, were there any weeks that stood out to you more than others? The after-party we threw for Opening Day of the races was definitely a memorable event. I think it really captured what I love so much about San Diego. From the bar area, one could see the sun just setting over the pool. The daybeds and cabanas were also full of people just having a good time. How does the future look for Rooftop Social? Will there be any changes or other events taking the place of Rooftop Social during the winter season? We'll be putting a pause on Rooftop Social on November 4th, until it opens back up in the new year! (Geez we're already talking about 2018? Where has this year gone?) Our happy hour will move over to Lionfish- info coming soon! As for the Rooftop, no huge changes but we have a few things up our sleeve for next year, so we'll see you on the rooftop then! In partnership with Rooftop Social at The Pool House, Gaslamp District Media is offering an exclusive deal for San Diego companies, organizations & groups who host their Happy Hour at The Pool House and LionFish! Each Host Your Happy Hour group receives a private cabana or table, a complimentary drink for each guest, as well as admission into Oxford Social Club that night*! 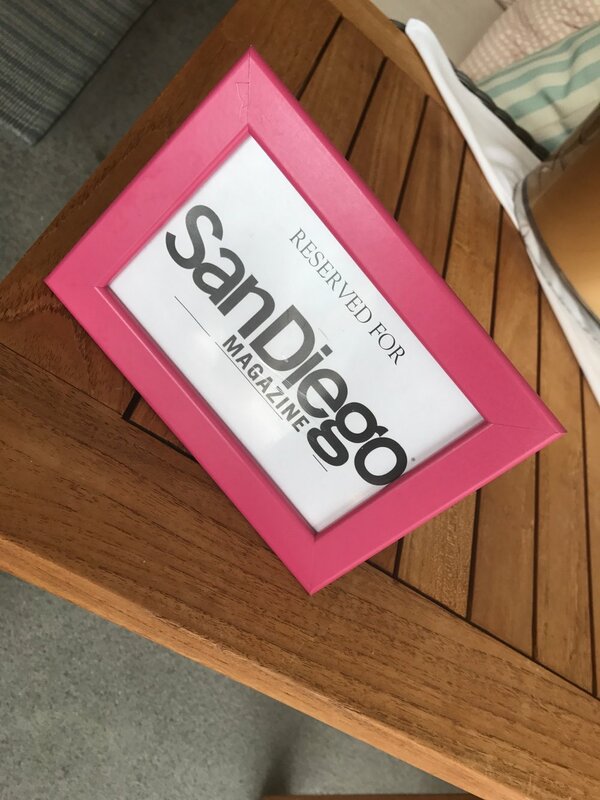 Throughout the summer, GDM welcomed numerous San Diego companies to share a drink with coworkers and friends while enjoying some awesome sunset views. Do you have a team that you would like to treat to Happy Hour? Contact kylie@gaslampdistrictmedia.com to reserve a date today! *Valid on nights that Oxford Social Club is open to the public (Thursday-Saturday most weeks). The Pool House is a client of Gaslamp District Media.